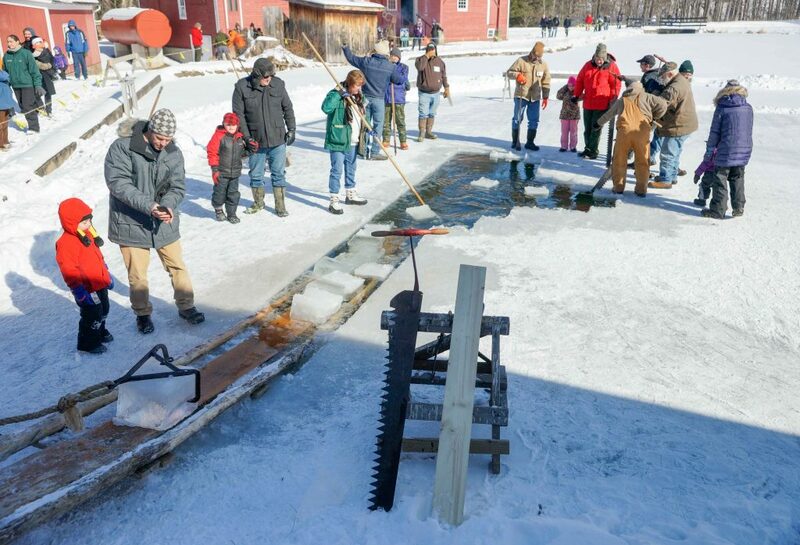 Please see the news release for the 2019 Ice Harvest Festival. [ East Meredith, NY June 2, 2017] On June 17, Hanford Mills Museum will open the Learning Lab, a new space for young children and their families to explore and create. The Learning Lab offers a range of activities, including building with gears and blocks from Keva and Imagination Playground, problem-solving challenges, mini-waterwheels and other power generation models, and a reading center with comfortable kid-sized seating. “We created the Learning Lab to provide an inviting, kid-friendly space to foster innovation and creative problem solving,” says Liz Callahan, the Museum’s executive director. “Kids can explore topics highlighted in Mill tours like power, energy, technology, and sustainable resources. And, because young children learn through play, we have lot of fun activities for kids to choose from.” She noted that the Learning Lab is included with regular admission. June 17 is a Free Family Saturday at Hanford Mills Museum, so any adult who is accompanied by a child under 18 receives free admission. Children and teens also receive free admission that day. Additional Free Family Saturday dates at Hanford Mills are July 22, August 12, and September 2. Hanford Mills staff worked with museum education consultant Katie Boardman of the Cherry Valley Group and Museum Studies students from the Cooperstown Graduate Program to create a space especially for children 8 and under. The planning was supported in part by a grant from the Museum Association of New York. Hanford Mills will continue to add activities to the Learning Lab, and will be installing solar panels on the roof of the building soon to provide opportunities to talk about solar power. The Learning Lab is located across the Mill pond from the Museum’s historic sawmill and woodworking shop. As one of only a handful of operating water-powered mills, Hanford Mills Museum has earned a place on both the National and New York State Registers of Historic Places. The mission of Hanford Mills Museum is to inspire audiences of all ages to explore connections among energy, technology, natural resources, and entrepreneurship in rural communities with a focus on sustainable choices. Hanford Mills Museum is located at 51 County Hwy. 12, at the intersection of Delaware County Routes 10 and 12 in East Meredith, NY, 10 miles from Oneonta and 15 miles from Delhi. The Museum is open Wednesdays through Sundays, 10 am to 5 pm, and also on Labor Day and Columbus Day. Children 12 and under receive free admission, as do Museum members, anyone with an EBT card, and Museum neighbors who live in the following zip codes: 13757, 13739, 13786, 13750, and 13806. For more information, visit www.hanfordmills.org or call 607.278.5744.